Drizzle over ice cream or cheesecake, mix into your smoothie or stir through a fresh fruit salad. 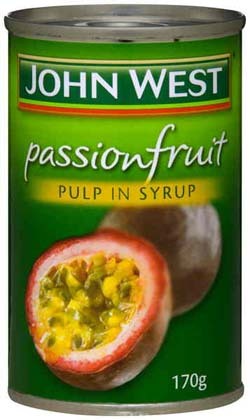 I spent a year in Sydney recently and fell in love with John West's pasion fruit pulp, a truly wonderful topping to ice cream, love it! Ho good to find an UK supplier. Love the stuff but, whenever I am sent John West pulp from Australia now, I find it is a 'Product of Peru.Is this also true of the John West product you are selling in your Oz Shop?